At 10 a.m. on Friday July 25th, the House Judiciary Committee will hold a preliminary hearing on the topic of impeachment, with a presentation by Congressman Dennis Kucinich. Driven by a sour economy and skittish consumers, U.S. business bankruptcies saw their sharpest quarterly rise in two years, jumping 17 percent in the second quarter of 2008, according to an analysis by McClatchy. Belladonna has some advice for the Pope. emptywheel: Karl Rove was trying to have Patrick Fitzgerald fired while Fitzgerald was still investigating Rove for his role in leaking Valerie Wilson's identity. ThePoliticalCat - Politics: Is It Impeachment By Another Name? McSame has attended zero of his committee’s six hearings on Afghanistan over the last two years. More than 1,200 people in 42 states now have been sickened by a rare strain of salmonella bacteria carried on tomatoes … or maybe hot peppers. Or maybe avocados. the fastest growing faith groups in the country are atheists and nonbelievers. This is what happens when you overdose on FoxNews. Foreign mercenaries have joined so-called "war veterans" and militiamen attacking opposition supporters in rural parts of Zimbabwe, human rights workers have confirmed. Russell Carollo continues his series on 'suspect soldiers' for McClatchy. Jon Swift on The Obama New Yorker Cover. A top Turkish prosecutor has brought charges against 86 people allegedly involved in a coup plot. The Nato-led effort to subdue the Taliban suffered one of its heaviest blows since the 2001 invasion yesterday when nine US soldiers were killed and 15 other Nato troops injured in a day-long battle in a region close to the Pakistan border. The nation's terrorist watch list has hit one million names, according to a tally maintained by the American Civil Liberties Union based upon the government's own reported numbers for the size of the list. 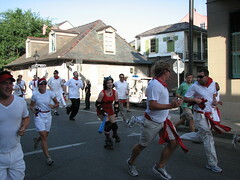 Big Easy Roller Girls armed with wiffle bats racing down Bourbon Street on a Saturday morning in New Orleans. Worsening tension between Iran and the West has been given a new twist by the revelation that the Royal Navy and allied forces have intercepted smuggled narcotics worth more than £800m coming out of Iranian ports. Much of the money, it is claimed, helps to fund the Taliban in Afghanistan. Although raids on drugs-carrying dhows have been going on for several months near the sensitive Straits of Hormuz, at the mouth of the Gulf, they have only now been made public. According to military sources, the dhows carrying the narcotics are loaded in a number of small Iranian ports, but Tehran strenuously denies being involved in the illicit trade. It says any Western allegation of a link to trafficking is propaganda, partly aimed at justifying its large-scale naval presence in the area. A yearlong examination of military and civilian records by The Sacramento Bee involving hundreds of troops who entered the services since the Iraq war began identified 120 cases of people whose backgrounds should have raised the suspicions of military recruiters, including felony convitions and serious drug, alcohol or mental health problems. The Royal Military Police have launched an investigation into an allegation that British soldiers sexually assaulted a 14-year-old Iraqi boy.